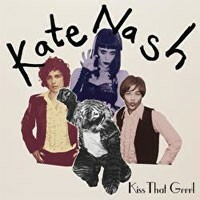 "Kiss That Grrrl" is a track influenced by the hits of Sixties’ girl groups. It has the huge Wall of Sound production (courtesy of Bernard Butler who produced the whole album) projected against the most base of human emotions: jealousy. Unlike some girl groups, Kate is not one to stand passively by when someone is making a move on her man. On the B-side are two brand new tracks, including a cover of The Shangr-las’ “Great Big Kiss” which is a duet with Billy Bragg.